Click here to learn more about the Natural Trim. A full explanation of the philosophy of the natural trim. Descriptions of all of the trim features, so that you are familiar with them before you begin. A section on Horse Handling, giving essential advice of how to deal with handling problems whilst trimming. A section on Good Barefoot Management, with important information on hoof protection, horse diet, and healthy lifestyle for the barefoot horse. 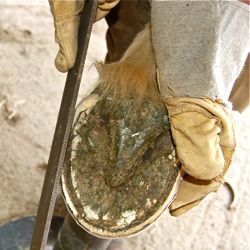 A glossary of terms explaining the parts of the hoof, and trimming terminology. A list of additional resources, showing you where you can find hoof trimming tools, hoof boots, and other useful information. 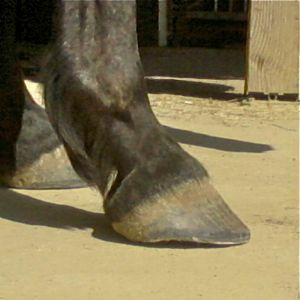 The healthy hoof, trimmed regularly to the right shape, has increased blood circulation to both the hoof and the whole limb, reducing the risk of laminitis, navicular disease, hoof abscesses, and arthritic joints. Increased circulation in the hoof has been shown to significantly aid the blood circulation throughout the horse's whole body, reducing strain on the heart during performance. As a result of greater comfort in the hooves, the horse's movement improves, making your riding experience more enjoyable, and reducing the long-term wear-and-tear from concussion to the limbs caused by toe-first landing. Learning to trim from an eBook?? You may be wondering if it's really possible to learn how to trim from an eBook. Many people who set about learning barefoot trimming go on barefoot trimming clinics in order to get hands-on guidance, but there are many advantages to having your own detailed reference guide to follow, step-by step, at your own leisure. We have both attended and run hoof clinics ourselves, and in the practical clinic situation, it is often difficult to ensure that all of the information being given is actually retained by the participants. The time available for one-on one teaching of the trimming skills to each student is often very limited, and progress is minimal. With the Seven-Step Natural Trim eBook, you can be sure that all the information you need is right there, written-down and displayed in clear photos, so you wont miss out on anything. You can proceed at you own pace, taking all the time you need complete each step. However you learn to trim, acquiring the necessary tool-handling skills just takes practice on your own part, but there are plenty of tips and techniques described in the Seven-Step Natural Trim eBook to help you, and you'll find you get more and more out of it as you go along. This comprehensive how-to Guide has seventy A4 pages packed with everything you need to know about hoof trimming. No irrelevant or repetitive information - just clear practical instructions and explanations, based on sound experience gathered over years of using this method on many different horses. Hoof trimming naturally is not rocket science, so you don't need a thick manual, or to attend costly clinics, to know how to do it well. What you do need is the right information, and that's what you'll find in the Simple Seven-Step Natural Trim eBook. 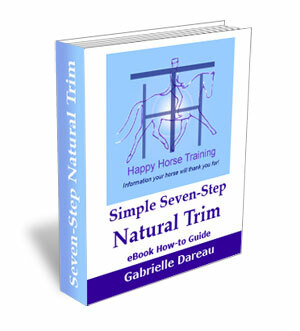 To purchase your copy of The Simple Seven-Step Natural Trim, just click 'Add to cart' below. You will be taken through a simple and secure payment process, then you will receive a link to download your copy of the eBook. Then you are free to print it out for your own use, or refer to it via any digital device at your own convenience. "Lovely: clear, concise and easy to follow." (Go to 196 Kilometers Barefoot and Cooperdene and his story to read this horse-owner's barefoot experiences. The natural trim makes all the difference is also a testament to the success of the natural trim. We are confident in the quality of our product, so we offer a full refund if you are not completely satisfied with your purchase. 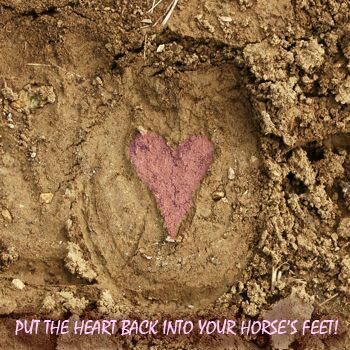 put the heart back into your horse's feet!